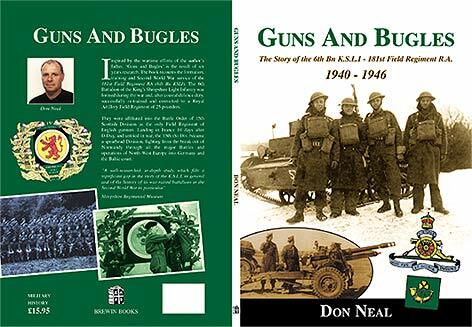 The History of the Book, "Guns and Bugles". My dad died in 1990. He never talked about the war much, only small anecdotes about the Army in general, but nothing specific. He always commented when he looked at maggots, how he'd seen millions of them consuming dead soldiers in the war. When we were kids, one of our neighbours was an old soldier who always talked about the war and I used to sit and listen in amazement. As my knowledge of the War increased I spoke to this old boy at length in his old age and discovered he was a sniper. His name was Vernon Thomas 1st Bn the Welsh Guards, a regular soldier at the outbreak of War and a Dunkirk veteran to boot. Amazingly, I discovered during my research that he and Dad fought under the same banner when the Guards Armoured Division came under command of the 15th Scottish Division at Monchamp in Normandy. When Dad had a bit too much to drink with Vernon he would bring up a story of three boys who died, but on these occasions he ended up fighting tears back. So I guessed he must have a few ghosts in his head. I got to wondering about in his war service after sending for his medals, and became interested in research years later after tracing my Family Tree. I discovered that one of my customers (I had a shop at one time) was a Military Researcher; he opened the door really. I got a copy of my Dads outline Army service, was introduced to another guy, Dave Gimes; he too had a vast knowledge of military history and in particular The King's Shropshire Light Infantry. He guided and advised me on the sources of information I could tap into. One of the first things I did was get hold of a copy of the History of the 15th Scottish Division. I was stunned to discover that far from being on the fringes of the fighting, my father's Division had been at the very heart of the heaviest fighting from the breakout of Normandy right through to the fall of Germany, very often coming under heavy fire and bombardment for days, enduring poor food and foul weather conditions for weeks on end. My Dad was just an ordinary bloke, he never talked of the heroic deeds of his Regiment or Division who had died, taking his secrets with him so that I could never share them with him. Never a day goes by when I don't regret that. There were hundreds of Regiments and Battalions that were formed for the War, whose men were taken from "civvie street", turned into soldiers, performed heroic deeds, and were forgotten when they returned home. Told to move forward and put the War behind them, their stories were never recorded for history. I wrote to the museum in Shrewsbury for the history of the 6th Bn KSLI; it arrived on an A4 sheet - the whole history!! I then wrote the Royal Artillery Institute for the history of the 181st field Regiment RA. There was no history!! So, I set about trying to find out what my had been up to in the War. It has been a labour of love. I have met many of his old comrades from all parts of the UK, had letters from many more, and compiled a catalogue of around 200 unique photographs. I've sifted through pages of Regimental orders, documents, and War Diaries. The story evolved itself and has resulted in the publication of my book. In a way it represents many of those unsung units whose war service has never been recorded. I hope you enjoy reading what is written here and find it interesting. If you would like a copy of the book itself, you can use the "Contact" Page to request one.